To create a new bill, select Bills-> Add from the main menu. Most likely you have received an invoice / receipt from a supplier and need to upload it to Elorus. You are advised to do that as a first step, to help you later fill in the bill data while previewing the document (see image below). To upload the attachment click anywhere near the "Drag & drop or click here to attach a receipt" link. First you need to select the supplier. If you don't see a specific contact in the drop-down list, just type a couple of letters in the search field. You may also create a new contact directly via the select box, without ever leaving the "add bill" page. IMPORTANT: To proceed with the bill lines & amounts the supplier must have been specified. Once you select a contact, the bill will be updated to reflect the supplier's default currency & taxes. This is an optional field, to help you identify this particular bill in the reports and via the search functionality. Typically, you would fill in the invoice number as provided by the supplier. Next, you need to specify the issue date. Select a date from the calendar or type the date manually. If the supplier has applied a credit period, optionally set the date by which the bill must have been paid. Elorus will track unpaid bills and promptly notify you when that date elapses. For your convenience, you may either provide the credit period in days (bottom-left image) or set the exact due date via the calendar (bottom-right image). From the “Amounts are ..” field, you can determine how Elorus will calculate tax amounts: If you wish to type in the total amount (including taxes) then select "Tax inclusive". Otherwise, select Tax exclusive to type in the amount you are charged pre-taxed. For each line on the bill you must specify the quantity, unit value and optionally a description, discount and taxes. Tip: To save time, if the bill does not affect your inventory (products / services), you could just type-in the total amount using a single line, regardless the actual lines on the bill. If the bill regards items in your inventory, use the Products / Services section to select existing items or create new ones. While typing the first letters of an item’s title or some numbers contained in the item's code, a drop-down list will appear from which you can select the desired one. 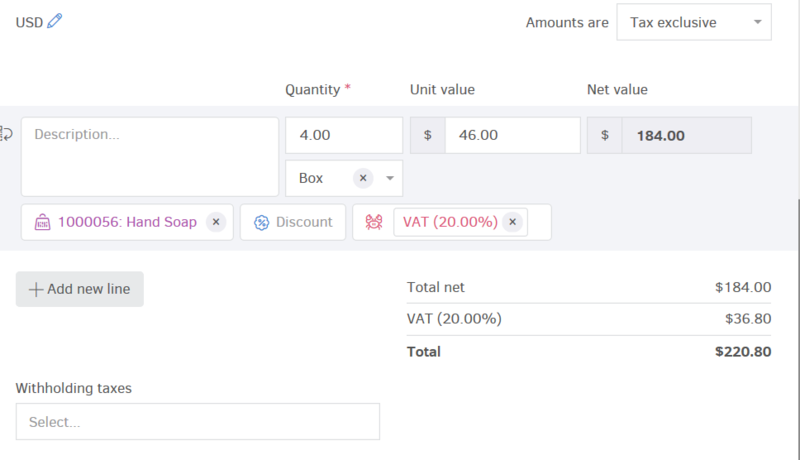 Once you select a product / service from the list, Elorus will automatically fill in the rest fields (unit value, taxes etc). Note: Once you associate a line with a product / service whose stock is managed (see the related article), the item's stock will increase by the number of units that the quantity field dictates. For more instructions on how to manage products / services in Elorus, refer to the related article. If you have set up custom categories to track purchases, you may associate bills with these categories. First, you have to select the category and next the option. By clicking Add New, you can create a new tracking option on the spot. You can also assign a tracking category from the bill's view page, once it is saved. To continue adding bills right away you can select "Save and add another". To just apply your changes thus remaining on the page to carry on working on the bill, you can select "Save and continue editing"
Draft bills are considered work in progress and can be further edited in the future. On the other hand, you cannot add payments to a draft bill and it does not participate in the financial reports. Whenever you're ready, you should mark the bill as issued, to denote the record is finalized. Once you add a payment, the bill status will change to partially paid or paid. (for more information on receipts and payments, see related article).